← Celebrate Book Month by Rattling the Skeletons in Rockaway’s Closet! Things have changed a lot in the past eight years. In October, 2004, I stood in front of my class of sixth graders at Channel View School for Research to teach a lesson on the skill of persuasive speaking–the literacy “genre of the month” as selected by regional office curriculum planners. I remember that I began the class by reading aloud an excerpt of a political speech delivered during the summer 2004 Democratic convention by a relatively obscure legislator from Illinois named Barack Obama. I will never forget how those cynical urban youngsters rolled their eyes skeptically at me when I stated with confidence that the speaker would, some day, become the first African-American President of the United States. I’m trying to decide whether I’d rather be living in 2004. The pay phone is still there! I wonder how much it is used nowadays. Thanks to Kiski Area student Hannah Milheim for snapping this photo for me. Then, over Columbus Day weekend, I thought hard about whether I’d rather be living in 1974. I walked through the vastly changed halls of my high school alma mater in Western Pennsylvania, at an open house commemorating the 50th anniversary of the school’s founding. It was comforting that the pay telephone outside of the yearbook office, where I called home regularly to check on my college acceptance letters, was still there. I vividly remember the day in 1974 when I got the good news that I was accepted to Northwestern University (which was known to some as the “Harvard of the Midwest,” and to others as the Big Ten school with the longest losing streak in college football history). 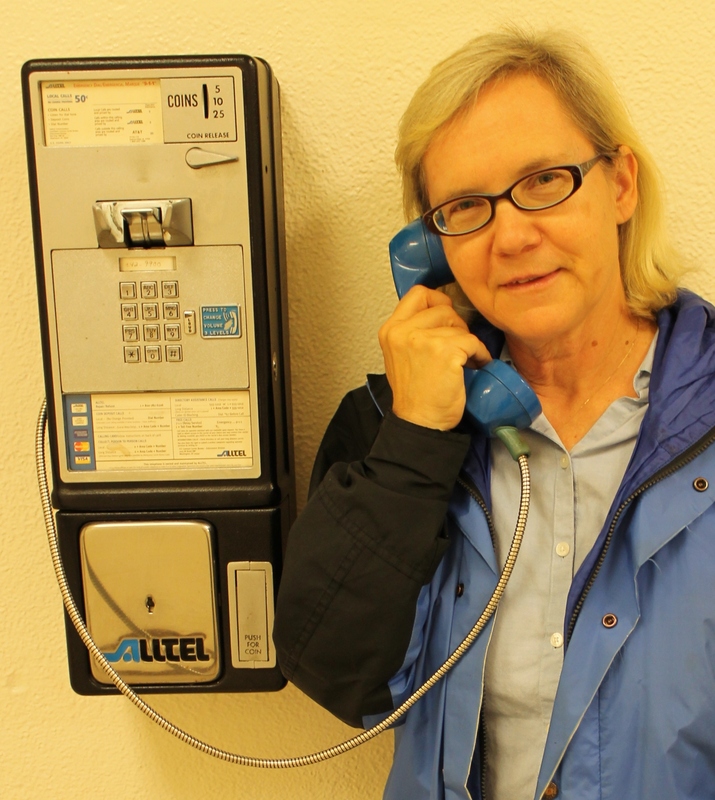 The scream of joy I emitted, standing at that pay phone, is fixed in my memory. 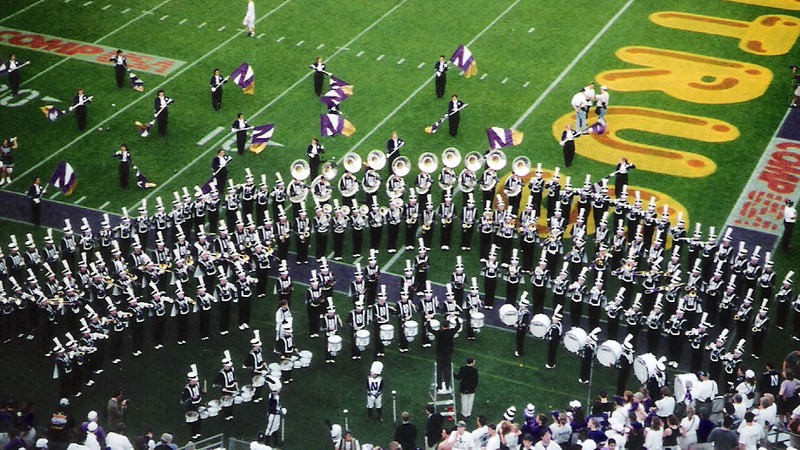 Northwestern Marching Band Performs Post-Game Show at Citrus Bowl, January 1997. The football team lost to Tennessee by an embarrassing margin that year, but the band was always a top competitor! At this point, I felt like I WAS in 1974. But the facts tell me otherwise. I see three framed diplomas on my wall. I’m the mother of two college-bound teenagers, with a box full of color brochures to show for it. I’ve been the owner of three automobiles and four residential properties over the past two decades, and more insurance policies than I care to count. Fifteen years of tax returns show a nice steady progression from my first full-time summer job at S. Klein Department Store, through a Wall Street stint in the late 1980’s. I adhered to the social contract and did my part to fill my home with the trappings of the American Dream, even earning nicely as a temporary part-timer through marriage, pregnancy, family crises, 9/11/01 and the crash of Flight 587. I have been an upstanding citizen—really. The question is—do I count anymore, now that I’ve received my first senior discount at Waldbaum’s? If so, how much? Do I count as just one vote to be cast among the vast numbers in the electorate? I don’t own Toys R’ Us, The New York Giants, or Barclay’s Arena. Perhaps I’d count more if I made a million dollars or owned a sports team or conglomerate. Instead, I’m just a passionate volunteer community activist and writer. 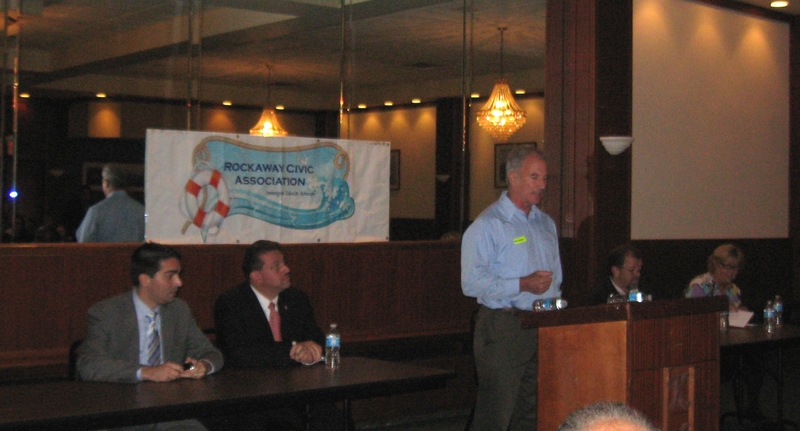 Debate on October 11, 2012, between City Councilman Eric Ulrich (seated, left) and State Senator Joseph Addabbo, Jr. (seated, center), sponsored by Rockaway Civic Association (Rick Horan, Rock Civic Vice-President, is at podium). 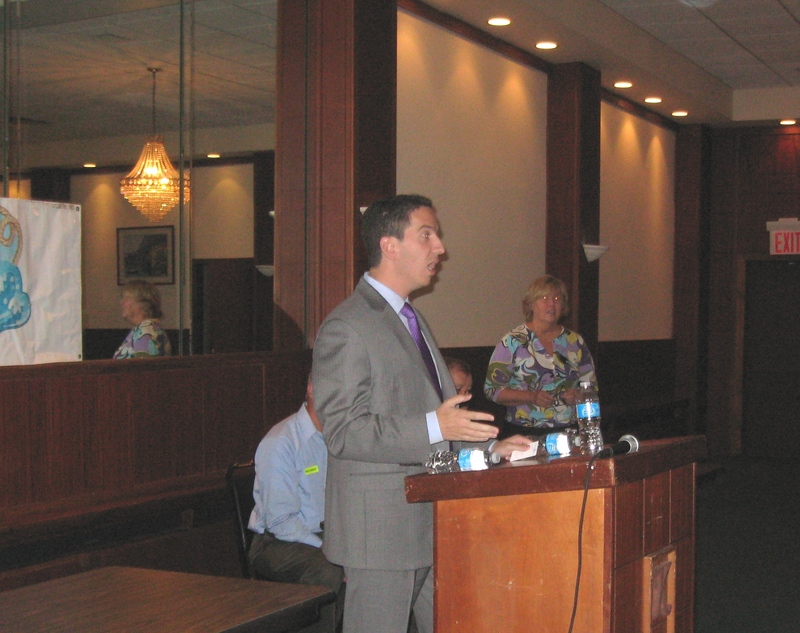 New York State Assemblyman Phil Goldfeder (shown here at the Rockaway Civic meeting prior to the debate in October 2012) is to be commended for leading the charge to restore the Whitepot Junction Line. so we need that train line! I ask all of our elected officials–when will the people of Queens, who welcomed this casino, get something in return, besides a passel of minimum wage jobs? And when will you, who step forward to lead, show more respect for the remaining ecosystems we have here along the bay and the coast? I think it takes enormous courage these days to defend what is wild, natural and beautiful, particularly where there is money to be made. On this subject, it should be mentioned that Addabbo has opposed fracking for natural gas, but Ulrich, disappointingly, has not. Fracking is a dangerous and greedy sport whose playing field is the fresh underground aquifers of the State of New York. I wish this were just a football game. And sometimes, I wish it were 1974. Text copyright Vivian R. Carter 2012. Photos copyright Vivian R. Carter 2012, or used with permission of owners. 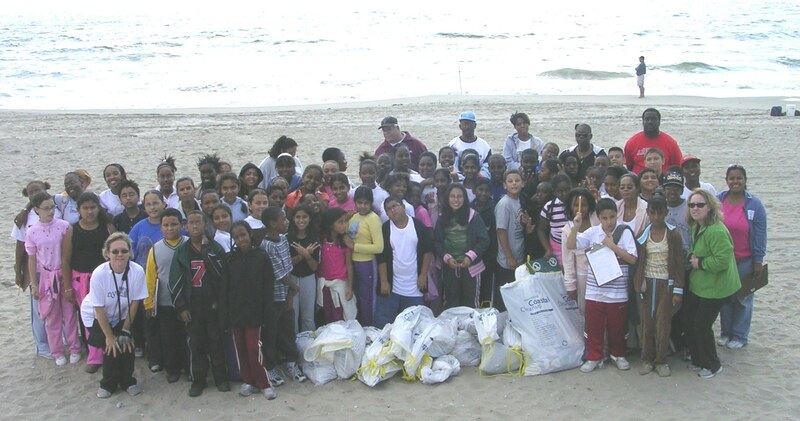 This entry was posted in Business and Economics, Creatures of the Planet (Non-Human), New York City Government, Planet Earth, Water and waterways and tagged community, developers, Jr., local news, New York City Councilman Eric Ulrich, New York State Assemblyman Phil Goldfeder, New York State Senator Joseph P. Addabbo, Rockaway, schools. Bookmark the permalink. 2 Responses to Are You Better Off Than You Were in 1974?